Consistent and accurate time across an organization keeps things running efficiently and smoothly. In a commercial environment time wasted on waiting for co-workers to arrive at a meeting or training session translates directly into lost productivity. Synchronized time in industrial environments promotes schedule adherence, helping the entire team meet productivity goals. In healthcare facilities, synchronized hospital clocks are critical to daily operations, whether it's checking on patients or delivering medications. Schools and universities rely on accurate timekeeping to smoothly transition students from one class to the next.Dynatek provides a complete solution for these vital needs. This system is designed with a latest technology having a TCP-IP communication facility. In this system, your existing LAN Network will be utilized for time synchronizing. PC will be connected to your existing LAN network through LAN switch & Dynatek Time Software will be loaded to PC now this PC acts as a Master PC & communicates PC time to all the clocks connected in LAN network. Hence there is no need of a separate Master Clock. Master PC will be provided with GPS receiver to synchronize GPS time. There is no need to keep the PC continuously â€œONâ€�, because each slave clock is provided with RTC hence it works as a standalone clock, therefore even though a PC is not in operation for 1 or 2 days all the clocks will show uniform time. Existing LAN network can be used for uniform time synchronization. There is no need of huge Cabling work. Any no. of clocks can be connected. Network connectivity Status can be checked through PC. Installation & maintenance cost is very low as compare to conventional clock system. There is no need to keep PC continuously â€œONâ€�. Converter for PC communication is not required. Each Clock can be assigned individual IP address. 1) Start Delay : After the Mains fail, the controller will wait for specific time to ensure the continuous failure of Mains before going for DG start - Up cycle. 2) Mains Return Delay : The controller will wait for specific time before putting the load from DG to Mains after the resumption of healthy Mains. 3) DG Warm-up Delay : The system to allow DG to run idle for specific time before putting the load on DG. 4) DG Cooling Time : The system to allow the DG to run idle for specific time before cut - off fuel supply to DG. 5) Crank On Time : The System allow the cranking for specific Seted time. 6) Crank Off Time : Silent timing betâ€™n two cranks. In this system Clocks are provided with RS485 communication port. 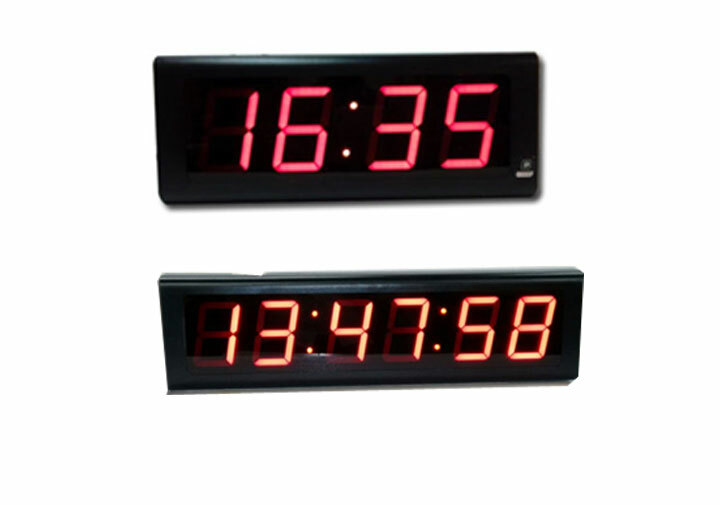 These clocks can be used as sand-alone display system or they can be a stansynchronized. Cat 5 shielded cable can be used to connect Master and slave clocks together to form a synchronized Network. All Slave clocks can be connected to your PC through RS-232 to RS-485 converter to form a synchronized network. Your PC acts as a Master & controls all slave clocks by transferring Time data at set intervals.If PC is having broadband internet connection, it receives time updates automatically from one of the Time Server and all slave clocks get synchronize with PC. (These servers are operated by the US National Institute of Standards & Technology -NIST), will set the time of the clock in your computer with the Atomic time scale operated by NIST. For more details visit www.worldtimeserver.com.When your PC is not in operation each unit acts as an accurate stand alone clock and get synchronized when PC comes in operation.In the event of power failure a long life lithium backup battery is provided it keep internal clock running, though the display go blanck accurate time is display when power is restored. DYNATEK Make GPS synchronize clock is designed to provide a accurate time by synchronizing with GPS time receiver. GPS system which contains highly accurate clocks transmit time signals to earth. The GPS receiver (Which can easily be mounted on a roof) picks up this time signals and send them to digital clock. This digital clock is configured as a stand alone clock or as a Master clock which drives several slave clocks in a network to display time information. No moving parts means greater reliability compared to electro-mechanical clock movements. RED colour seven segment bar display with a long distance visibility. 12 hour or 24 hour display format. 4 or 6 digit display-Hour, Minute and Second.